I will begin this with a disclaimer that may or may not be obvious given my history: I would have watched, and potentially convinced myself of the staggering brilliance of, every episode of the first television series starring Julia Roberts regardless of its content. Had it been a procedural in which she assumed the role of a chef-turned-detective who investigates restaurant crimes the way only she knows how, I would have gladly watched all 24 episodes of its one and only season. Had it been an avant-garde spinoff of The Big Bang Theory about a helium molecule’s daily misadventures with her hydrogen and lithium friends, I would have called it “clever and oddly transfixing.” But her first series wasn’t some painful creative misstep or ho hum network bore, it was a proper piece of prestige television. Homecoming isn’t just a thrilling and deeply rewarding season of television, it’s one of Julia Roberts best roles in years—not to mention her best wigs since Notting Hill. Homecoming is Amazon’s 10-episode television season starring Roberts, Stephan James, and Bobby Cannavale, based on a 12-episode podcast season that starred Catherine Keener, Oscar Isaac, and David Schwimmer. I did not listen to the podcast, but because the same writing duo (Eli Horowitz and Michah Bloomberg) wrote both, I suspect they cover a nearly identical story, which I will describe succinctly and spoiler-free here: In 2018, there is a mysterious facility called Homecoming Transitional Support Center where Heidi Bergman (Roberts) works as a counselor helping U.S. soldiers returning from war cope with their trauma and make a successful return to civilian life. She forges a particularly strong bond with a twenty-something soldier named Walter Cruz (James, perfectly cast as the show’s calmly beating heart), all while dealing with the demands of her hot-tempered boss (Cannavale, in a brilliant and terrifying performance) whose larger motivations are initially unclear. The show avoids the trappings of its tired structure and “Boo! It’s the government!” message, largely because it’s such an aesthetically and theatrically rewarding creation. Because no television worth its salt could possibly find satisfaction with a single timeline, Homecoming has a parallel narrative set in 2022, and follows a lowly government investigator (Shea Whigham) trying to find out what the hell the Homecoming Transitional Support Center was up to. Regardless of their chosen medium, we know how stories like this work: the mystery will slowly unravel, the two timelines will converge in some bombastic climax, and all will finally become clear—or, since our culture has finally had it with neat endings, clear-ish. Couple that with the fact that the the mystery, once revealed, isn’t all that interesting, and it sounds like I’m describing the sort of slog with which we’ve grown all too familiar in this overwhelmingly unreliable age of allegedly must-see prestige television. But the show avoids the trappings of its tired structure and “Boo! It’s the government!” message, largely because it’s such an aesthetically and theatrically rewarding creation. A meticulous craftsman, the show’s director Sam Esmail (Mr. Robot) treats Homecoming like a noir that rolls and bops and twists with the steady churn of a Rube Goldberg machine. No piece feels out of place, and each one has a purpose—or at least the threat of one. His camera and his cast drift through their warmly lit world with an eerie precision perfectly suited for a mystery in which structure and order give way to chaos. These mesmerizing tracking shots, unnerving zooms, and claustrophobic framing do so much of the show’s heavy lifting, that one can imagine the series being almost as successful even without such a talented cast. But Esmail, who directed all 10 episodes, lucked out and got Roberts, James, Cannavale, and the rest of the show’s powerhouse performers (like Sissy Spacek and Marianne Jean-Baptiste in a pair of small, but crucial roles). The show is good, is what I’m telling you, and Roberts has a major hand in keeping it so consistently satisfying. We haven’t seen much of Roberts since 2010's Eat, Pray, Love. Even August Osage County, which garnered her a well-deserved Oscar nomination, was a forgettable blip in what proved to be a pretty stellar year for film. And while her “comeback,” if you can call it that, was always an inevitability (last year she led the sleeper family hit Wonder and will star in next month’s Ben Is Back with Oscar nominee Lucas Hedges), it’s exciting to know that she decided to make a streaming TV mystery part of this era’s tableau. Roberts has never been one to phone in a performance (even her brief appearances in the terrible Money Monster and even more terrible Mother’s Day), but it’s been a while since she’s been given this much to do–not to mention a world this unique to do it in. As Heidi Bergman, Roberts flaunts two of her biggest strengths: charm and doggedness. She is a charming counselor prone to flashes of intimidation whose big smile could practically melt away any sense of dread a patient may feel (at least while she’s in view). Later, she unleashes her inner Darby Shaw and gives us a sympathetic portrayal of a woman who is fighting for her life. Plus, she gets to wear wigs! Roberts’ hair has, in my memory, never looked quite like it does in Homecoming, where it bounces back and forth between a sort of polite bang and a casual, wavy lob. It’s distracting until you realize there’s far too much else to focus on. 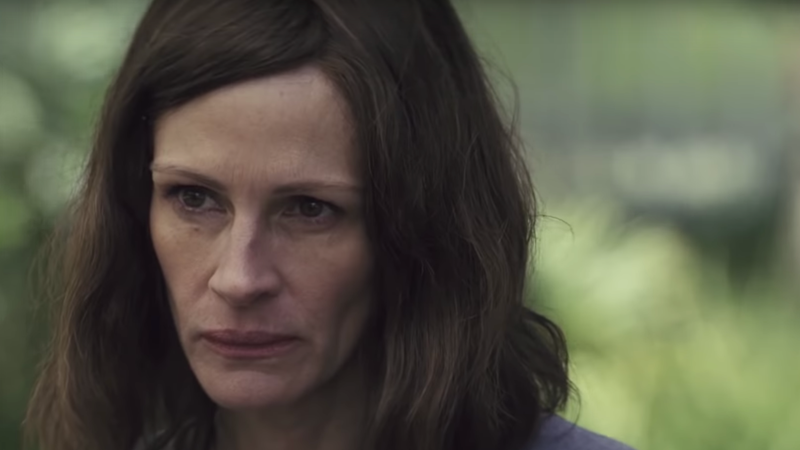 Homecoming is an exciting and frequently captivating entry in the crowded category of prestige drama, but more importantly it’s a comforting reminder that Julia Roberts is still as fun to watch as she’s ever been. At a cool and efficient roughly 25 minutes each, it’s the rare half-hour drama you can finish without feeling like you’ve wasted time on a show that spends 13 hours telling a three-hour story. Though Amazon has ordered a second season of Homecoming (true conclusions are a luxury in 2018), the finale provides a satisfying end to the story so far. And its final shot is as acutely considered as everything that came before it: our star, Julia Roberts, smiling. No podcast can quite match that. Homecoming is currently streaming on Amazon Prime Video.